Instructors can use a Master Course to create and store content for a course to be taught in a future semester. Students do not get enrolled in Master Courses, so any content will need to be transferred to a teaching course before students can access it. Only one Master Course per course number per instructor is allowed. For information about how to restore or import content into any Moodle course, see GROK article #18477 "Moodle 3: Ways to Restore or Import Content into a Course." 2. 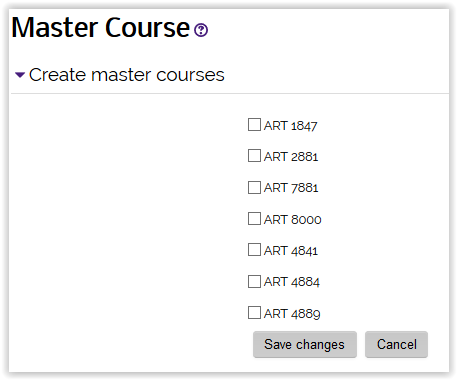 Click on the Master Course link in the Course Preferences System block on the Home level of Moodle. 3. Click the box next to any courses for which you want Master Courses created. If you want a Master Course for a course that does not appear on the request form, contact the Faculty Technology Center to request that it be created manually.